I've always loved reading books, or even just browsing though the pages of a boo, looking at the pictures and words, and also love the smell of these yellowish old books. Books are for me a source of inspiration, especially when it comes to my passion : cooking. My parents had a little collection of cookbooks, that I've started reading very early. Some "basic" recipes that I still use today do come from these old cooking books in our family kitchen. I then started creating my own cookbook collection, new or second hand, found in used books fairs, flea marts and book shops. Then I packed my bags and started travelling around the world. When you leave with your house on your back like a snail, you can't carry your cookbook collection around, that's a fact. I then decided to go on a regular basis to the different public libraries of the towns I was living in to borrow my beloved cooking books. I'm still doing this now in England, where I go to the library at least once a month and come back home with more that ten cooking books every time. What a great pleasure to go through all these books, admiring the amazing pictures, and reading mouth watering and inspiring recipes. I've read a lot of cooking books. And as it seems to be a booming "business" at the moment, I'll always have new ones to discover. Today, I'm writing a special post. There is a recipe, yes, as usual (at the end of the post! ), which is coming from a book that I first want to present to you. The Vibrant Table: Recipes from My Always Vegetarian, Mostly Vegan, and Sometimes Raw Kitchen, by Anya Kassoff, Photography by Masha Davydova. 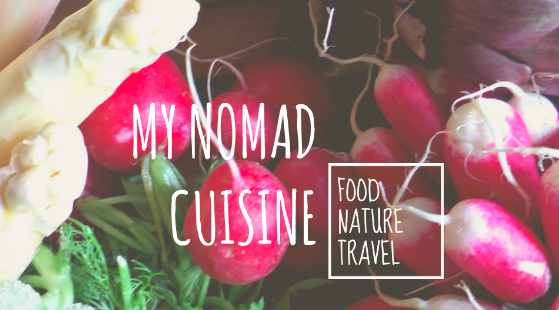 Anya Kassoff is the brilliant cook behind the food blog Golubka, where she's shares her original recipes, inspired by what the nature is offering us. Simple flavours, sometimes with a russian touch (Anya is originally from Russia), or inspired by other world cuisines. Anya's recipes are always inspired by seasonal produce, and simple ingredients that are easy to get your hands on. She has actually introduced a very complete and interesting list of her favourite ingredients that are used in the recipes. She's giving advice, techniques and nutritional information of different flours (especially gluten free flours), nuts and seeds, pulses and legumes, oils and butters, plant based milks, seaweeds… I really like these kind of introductory chapters in cookbooks, where you always discover new ingredients, and learn how to use your ingredients even better. Before the main recipes of the book, Anya also presented a "basic recipes and techniques" chapter, where you learn how to make homemade ricotta, ghee, almond milk, or even raw chocolate. I'm a big fan of everything "homemade", and always try myself to make everything I can from scratch, reaching for ready-made foods as less as possible. It's always a better choice to go for homemade, I believe… cheaper, healthier, and most of the time tastier! Along the book, Anya invites us at her table, in her life, and we discover a unique way to cook that has been inspired by her travels, discoveries, family recipes, or childhood memories. Anya shares her secrets and particular memories that inspired her recipes. This kind of writing is getting more and more common in cookbooks. A cookbook is not just a pile of recipes from A to Z, with only a list of ingredients and method to follow. Cookbooks are now very personalised, they're telling a story, a particular relationship to food and cooking, a lifestyle. I really enjoy reading these kind of books and find them very inspiring. Furthermore, I'm the kind of cook that never follows a recipe to the gram : I get inspiration from a recipe and add a bit of this or a pinch of that. 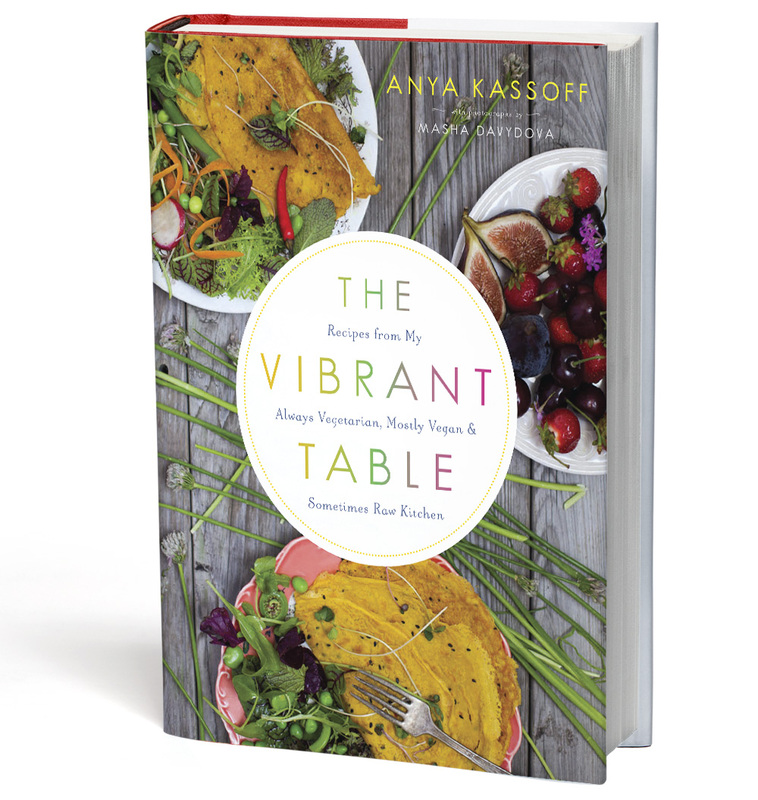 The Vibrant Table is perfect for this kind of cooking, and Anya says it at the beginning of the book : "Trust your experience and intuition, while getting inspiration from my recipes. I hope that this book will encourage you to set yourself free and enjoy yourself in the kitchen". (translated by myself from the french version). As I said it before, the recipes are inspired by fresh seasonal produce. Following the season is very important to me too, as I grew up in the country, surrounded my garden, fields and orchards. Anya is celebrating the seasons in her recipes, like in her "Big fall salad", with an amazing mix of squash, brussel sprouts, beetroot, apple, pear, persimmon, seasoned with pecan nuts, cider vinegar and walnut oil. Fruits and vegetables are the real heroes of all the recipes : Zucchini spaghetti with nectarines, Caramelised fennel and fig pizza, or those amazing whole fig cupcakes (see picture below). The recipes are mostly simple, but may have a quite long list of ingredients that could scare some people away. I guess it's just a question of habit and intuition, you learn to swap and replace ingredients by others. I do improvise a lot when I cook, getting inspiration from recipes and changing them depending on whatever I have in the cupboards. It doesn't always work, of course, but it's by experimenting that we learn, isn't it? The recipes are very clearly explained, and in details, so it's perfect for everybody, beginners as well! You probably guessed it, I loved this book, and can't wait to try all the recipes! I can only recommend you to read it too! - recipes for everyone, not only vegetarians, vegans, gluten intolerant or raw dieters : those recipes are for all food lovers! The book The Vibrant Table: Recipes from My Always Vegetarian, Mostly Vegan, and Sometimes Raw Kitchen, by Anya Kassoff, Photography by Masha Davydova. is available in French on the website Natura Sense which is also offering a great variety of cookbooks around wholefoods/vegetarian/vegan/juicing/seaweed... and also kitchen equipment and gadgets for healthy cooking, like juicers and dehydrators. The book is also available in english on Amazon. I've had trouble choosing a recipe to share with you from this book, and I'll probably share some more in the future. But here's my choice, very seasonal and simple : "Butternut and sage croquettes"
Heat 1/2 tbsp of oil in a pan, and fry the onion and garlic on medium heat for 4 to 5 minutes, until the onion is transparent. Remove from the heat. Wrap the grated butternut in a few layers of paper towel and press lightly, so the paper absorbs the excess of liquid. (or drain and press the grated butternut in a colander). Put the butternut in a large bowl with the egg, salt, pepper, paprika, nutmeg, sage, parsley, feta, onion and garlic, and the nut powder. Mix well. Cover a baking tray with baking paper. Form the croquettes with your hand and put them on the tray. Brush the top of the croquettes with the remaining olive oil, using a pastry brush. Bake for 10 minutes. Take the tray out of the oven, and flip the croquettes over with a spatula. Bake for another 10 minutes. Enjoy hot or cold with some natural yogurt and a green salad. Je suis une grande fan de livres. L'un de mes plus grands reves a toujours été d'avoir une immense bibliothèque comme Belle dans la Belle et la Bete. Si, si, une de ces bibliothèque avec des étageres pleines de livres et tellement hautes qu'il faut une échelle pour atteindre les livres les plus hauts. Bon, mettons ces jolis rêves d'enfant a part un moment… J'ai toujours aimé lire, ou juste feuilleter un livre, en regarder les images, sentir l'odeur des vieux livres aux pages jaunies. Les livres sont pour moi une source d'inspiration, particulièrement quand il s'agit de ma passion : la cuisine. Mes parents avaient une petite collection de livres de cuisine, que très tôt j'ai commencé a feuilleter. Certaines recettes que j'utilise encore aujourd'hui sont issus de ces vieux livres de cuisine de la maison familiale. J'ai ensuite commencé ma petite collection de livres de cuisines, neufs ou d'occasion, glanés aux foires aux livres, magasins de seconde main, marchés aux puces et libraires. Puis j'ai fais mes valises et ai commencé a parcourir le monde. Dur d'emporter ma petite libraire culinaire avec moi a l'autre bout du monde… J'ai alors pris gout a aller régulierement a la bibliothèque, pour emprunter des livres de cuisine. Encore aujourd'hui, je me rends au moins une fois par mois a la bibliothèque, et reviens avec une dizaine de livres de cuisine a la maison. Quel plaisir de feuilleter ces livres, d'admirer les merveilleuses photos, et d'avoir l'eau a la bouche en lisant les recettes. J'en ai lu des livres de recettes, beaucoup. Mais c'est un domaine en pleine expansion, et je crois que je n'ai pas fini d'en découvrir de nouveaux. Aujourd'hui, c'est donc un article un peu particulier que je vous propose. Une recette oui, en fin d'article, tirée d'un livre que je vais vous présenter. Green, Cuisine végétarienne, sans gluten, souvent vegan, parfois crue, D'Anya Kassoff. Photographies de Masha Davydova. Anya Kassoff est la créatrice du blog culinaire anglophone Golubka, ou elle partage ses recettes originales, naturelles, inspirées par ce que la nature nous offre de meilleur, de saveurs simples, parfois teintées de ses origines russes, ou d'autres cuisines du monde. Les recettes présentées par Anya Kassoff sont inspirées par les produits frais de saison, par des ingrédients simples et accessibles. Elle présente d'ailleurs une liste exhaustive et très intéressante de ses ingrédients préférés, utilisés dans les recettes du livre. Elle y donne conseils, techniques et données nutritionnelles, sur les diverses farines (sans gluten), fruits a coques et graines, céréales et légumineuses, huiles et beurres, laits végétaux, algues… J'aime beaucoup ce genre d'introduction dans les livres de cuisine, qui permettent souvent de découvrir de nouveaux aliments, et d'apprendre a les utiliser au mieux. Avant de se lancer dans les recettes, Anya a développé un petit chapitre de "Recettes et techniques de base". On y apprend comment réaliser une ricotta maison, du beurre clarifié (ghee), lait d'amande, ou encore du chocolat cru. Grande fan du tout fait maison, j'aime apprendre a réaliser des ingrédients de base moi-même, pour avoir recours aux produits transformés du commerce le moins possible, tant pour des raisons de santé qu'économiques. C'est toujours moins cher, meilleur au gout et meilleur pour la santé, quand c'est fait maison. Au fil du livre, on découvre un petit bout de vie, une personnalité, un mode de cuisine inspiré par des voyages, des découvertes, des recettes de famille, des souvenirs d'enfance. Anya livre ses secrets, les souvenirs particuliers qui lui inspirent ses recettes. Ce mode d'écriture dans les livres de cuisine est de plus en plus commun. Le livre de cuisine c'est plus qu'un rassemblement de recettes de A a Z, avec simplement une liste d'ingrédients et une marche a suivre. Les livres culinaires sont maintenant personnalisés, ils racontent une histoire, une relation particulière a la nourriture, un mode de vie. Personnellement, j'aime beaucoup ce genre de livres : je les trouve inspirants. De plus, je suis le genre de cuisinière qui s'appuie sur une recette en y ajoutant un peu de ci ou un peu de ça, plutôt que de suivre une recette a la lettre. Et Green est parfait pour cela. Anya le dit elle-même au début du livre, : " Faites confiance a votre expérience et a votre intuition tout en puisant votre inspiration dans mes recettes. J'espere que ce livre vous incitera a vous libérer et a vous épanouir en cuisine!". Ca, c'est tout a fait moi. Comme je l'ai dit précédemment, j'aime beaucoup le fait que les recettes soient inspirées par la saisonnalité des produits frais. Suivre les saisons est très important pour moi, ayant été élevée a la campagne au milieu des champs, vergers et jardins, suivre les saisons est pour moi normal. Ainsi, Anya propose une "Grande Salade d'automne", ou potimarron, choux de Bruxelles, betteraves, pomme, poire et kaki se mélangent aux noix de pécan, vinaigre de cidre et huile de noix. Un mariage parfait, tout en simplicité, qui célebre les délicieuses saveurs automnales. Les fruits et légumes occupent le rôle principal des recettes du livre, Spaghetti de courgette aux nectarines, Pizza au fenouil caramélisé et a la figue, ou les étonnants cupcakes a la figue. Des recettes souvent assez simples, qui peuvent comporter une longue liste d'ingrédients qui eut en effrayer certains. Question d'habitude en cuisine et d'intuition, on apprend a remplacer les ingrédients qu'on n'a pas sous la main par des alternatives. J'improvise beaucoup en cuisine, en m'inspirant de recettes et en les modifiant un peu selon ce que j'ai dans les placards. Ca ne marche pas toujours, bien sur, mais c'est en expérimentant qu'on apprend! Les recettes sont très bien expliquées, dans les moindres de détail, parfait pour les cuisiniers de tous niveaux! Je dois aussi vous dire un mot sur les photos du livre : sublimes! La partenaire gourmande de l'auteure n'est autre que sa fille, Masha Davydova, qui est la photographe du livre, ainsi que du blog Golubka. Elles semblent former un duo parfait : les recettes simples et gourmandes sont présentées de manière simple, familiale, sans chichis, mais dans des images pleines de couleurs, très végétales, ou les fruits et légumes occupent encore une fois le premier plan. On admire la simplicité et la beauté de choux fleurs colorés, d'un fenouil, d'un poireau finement émincé sur une planche en bois. On se sent "a la maison" en feuilletant ce magnifique livre, et on a qu'une envie, essayer toutes les recettes! Vous l'aurez compris, mon avis est plus que positif sur ce livre! Je ne peux que vous en recommander la lecture! - des recettes qui s'adressent a tous, pas seulement aux végétariens, végétaliens, allergiques au gluten ou crudivores : il y en a pour tout le monde! J'ai eu beaucoup de mal a choisir une seule recette du livre a partager, mais qui sait, j'en partagerai peut-être d'autres plus tard! Voici donc une recette de saison et assez simple : des croquettes de butternut a la sauge. Mettre a chauffer 1/2 c.a.s d'huile dans une poele et y faire revenir les oignons et l'ail a feu moyen pendant 4 a 5 minutes jusqu'a ce que l'oignon soit transparent. Retirer du feu. Préchauffer le four a 200'C. Entourer la courge rapée de plusieurs épaisseurs d'essuie-tout et appuyer doucement pour permettre au papier d'absorber l'exces de liquide (ou égoutter et presser la courge rapée dans une passoire). Mettre la courge rapée dans un saladier et y ajouter l'oeuf, le sel, le poivre, la sauge, le persil, le paprika, la muscade, la feta, l'oignon et l'ail, et la poudre de noisette/noix/amande. Bien mélanger le tout. Recouvrir une plaque allant au four de papier sulfurisé. Faconner a la main des croquettes de pate et les déposer sur la plaque. Badigeonner les croquettes d'un peu d'huile d'olive avec un pinceau de cuisine. et enfourner pendant 10 minutes. Sortir la plaque du four, retourner les croquettes a l'aide d'une spatule et enfourner pour 10 minutes supplémentaires. Servir chaud ou froid avec du yaourt nature et une salade verte. J'adore la sauge, et elle se marie vraiment bien avec la courge dans cette recette! bien tentant... la sauge n'est pas facile à utiliser..; je n'arrive pas à m'inscrire à la newsletter...Est-ce normal? Merci ma Gallou pour ce partage! Oh merci Gisou! Ravie que la recette t'ait plu! Cette recette est facilement adaptable avec d'autres herbes et épices, comme tu le suggères!